Why do new products sound like WWII submarines? Review Part of LG's Black Label series (sounds like a whisky), which also includes the KG800 Chocolate, the U970 features a brushed metal casing and a mirror effect display that makes it look more like an exquisite sculpture than a 3G, 2-megapixel camera and MP3-enabled phone. The U970 has a slider style handset, which opens with sickening smoothness to reveal a compact Motorola Razr-style keypad. The sliding movement requires a greater than average thumb push to open, which means it won't slide open in your pocket. 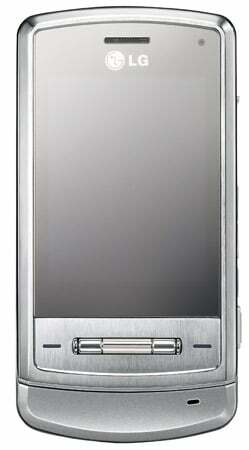 The metal body also gave us confidence that the handset was robust and could survive the odd bump and knock. The 240 x 320 pixel QVGA display screen is the handset's best aesthetic feature. It provides a clear resolution of up to 262,000 colours when in use and transforms into a mirrored surface when in standby or slid down, making it perfect for the more image conscious mobile users. In addition, its slim dimensions, 9.98 x 5.06 x 1.37cm and 119g weight, mean it is very jean, shirt, and suit pocket friendly. A scroll wheel underneath the screen is used to browse through and select menu options. This is fine when, for example, just browsing the internet, but having to push down on the scroll wheel to select options meant we often selected something different to the one wanted, which quickly became very annoying. Two soft keys for alternate menus also feature on either side of the scroll wheel. It seems a slight fashion faux pas that LG has decided to cram all the U970's shortcut keys onto its left-hand side. There are two selection buttons that serve a myriad of purposes, including adjusting the in-call volume and browsing through the main menu, one for main menu access and another for the camera. Lift a silver flap, also on the left-hand side, and you're able to plug in the power charger. Unfortunately, the port also doubles up as the headphone jack and USB port though, meaning we were unable to charge, listen to MP3s, and transfer data at the same time. On its underside, the U970 features an auto-focus, 2x zoom and a 2-megapixel Schneider Kreuznach certified lens. It's capable of snapping in a range of sizes, ranging from 1600 x 1200 at the largest and down to 176 x 144, which made it easier to alter the size of an image when shooting different scenes - in our case Big Ben and close-ups of our lovely receptionist, Hannah. Image quality can be adjusted between super fine, fine, and standard settings, according to light levels. A built-in flash also means images can be brightened in dark conditions. Combining these features resulted in some decent quality images under a range of conditions. However, the lens is positioned on the underside of the phone, rather than only being available when the phone is slid open, meaning it was continually exposed to potential scratches and the like. That design flaw aside, one nice feature is the ability to get creative with images and apply different effects, such as sepia or black and white. Frames can also be applied before the image is taken to ensure the subject is always perfectly positioned. PictBridge technology is also supported, so snaps can be printed without needing a PC. Any user hoping to use this feature will need their printer to have a type A USB port though. LG has wisely included a second VGA camera, of unspecified megapixel ability, on the phone's front. The lens performs all the same functions as the primary camera and is particularly useful for taking pictures of yourself with a group of friends. Since the tri-band U970 is 3G equipped, the second lens is also used for video calls. Our test handset came from 3, so we were expecting big things from the 64Kbps data upload speed that the network operator claims is possible. Sadly, screen quality for video calls was juddery at best, with sound often falling out of synch with the vision, and the device sometimes struggled for service outside the capital. Several video call options are available though, such as adjustments to the facial positioning of the U970 user, picture size of the caller, and substitute pictures - should you wish to cloak your image under a pseudonym. Hand-in-hand with the U970's 3G capability sits its HSDPA technology that provides internet x-HTM access at monstrous 3.6Mbps in UTMS mode. Internet content and features, such as games, music, and news are service provider dependent, but 3's network served up a varied selection - we even downloaded a full music track in about 35 seconds. Unfortunately, the phone is again let down by image quality. While watching video clips, the video was juddery, blurred, and frequently interrupted by breaks in service or buffering. Our interest in download content lapsed quickly as a result, so we switched to the handset's music capabilities. LG provides software to turn the U970 into a music player and, although it's no match for the iPod's ease of use, the ability to recognise multiple music formats including MP3, AAC, and AAC+ is a strong plus. The U970 is also polyphonic, but the lengths LG has gone to in understanding the handset's target audience (posers, WAGs' and the odd magpie) are highlighted by its ability to stream music in Bluetooth A2DP stereo to a compatible Bluetooth headset (not included). With data storage levels continuing to rise across all IT platforms, we were shocked not to see any available memory card ports on the U970. The handset does have a whopping 575Mb internal memory though, but requires connection to a PC via a USB cable (supplied) to transform it into what LG calls a software-free "mass storage device" for dropping music, photos, and videos onto the memory. This feature is fine if you are willing to continually carry your USB cable in the event you should wish to swap Artic Monkeys for Babyshambles, but if not then the lack of a storage card is a pain. A server synchronisation feature caught us by surprise because the U970's looks and feels out of synch (pun intended) with such a relatively advanced feature and target market. After several attempts we failed to get the feature working though, but were reassured by the handbook that we should theoretically be able to synchronise the phone's data with that on a server, such as contacts, and to "do items" via a wireless network. Texting (should that be txting?) is a pleasurable process akin to Nokia's high standard of logical and under-friendly input. Messaging capabilities on the U970 also support all major formats; SMS, MMS and EMS. The U970 is also fully email compliant. We tested its ability to hook us up directly to our email account and, although it proved quite fiddly to set up, worked smoothly for both sending and receiving emails thereafter. Should this feature be unavailable for any reason though, the U970's internet access will enable for access to web-based email accounts, such as Gmail etc. USB port, meaning we were unable to charge, listen to MP3s, and transfer data at the same time. By now we had used the phone for several hours and the battery was starting to run down to about 60 per cent, with LG claiming it can provide around three hours' talk time and around 261 hours in standby. Thankfully, a standby mode that dims the display after a set period of inactivity helps save some of its precious battery time. A more worrying problem, though, was handset heat. The top section of the phone's underside seemed to heat up like a radiator after several hours of use and actually became quite hot to the touch. LG has made use of Flash functionality around the handset, which helps liven up the screen's background, and moving graphics and images appear behind the mirrored surface. We aren't sure who LG is trying to target with its secret memo function within the U970's calendar - a teenager hiding texts from their parents or a James Bond wannabe perhaps? But we gave it a go and found we could write ourselves messages and then lock access to them with a four digit password, which might be useful. Maybe. If style was all that mattered, the LG U970 obeys the rule to the letter. Mirrored surfaces, brushed metal, and a sleek design mean the handset will appeal to those with a penchant for elegant equipment to complement their designer handbags or tailored suits. Looks aside, the U970 sports a solid range of connectivity and entertainment features, but lacks the technical punch available from the heavyweight application bundles on many PDA handsets.